The National Green Tribunal has said that the Uttarakhand flood of June 2013 was not an “act of God” and asked Alaknanda Hydro Power Company to pay a compensation of Rs 9.26 crore to the people affected by the disaster. The court held the company liable for lack of proper care in storing muck, leading it to flow during the floods to the Pauri Garhwal district. Justice U D Salvi, who was heading the bench, said that an act of god provides no excuse unless it is so unexpected that no reasonable human foresight could be presumed to anticipate the occurrence, having regard to the conditions of time and place known to be prevailing. The bench has directed Alaknanda Hydro Power to deposit the sum within 30 days to the Emergency Relief Fund Authority, which will be paid to the victims of the disaster. The court said that 2013 floods occured due to cloudburst in the upper reaches of river Alaknanda near Kedarnath, unlike the floods in 1894 and 1970 as per a report published by Ministry of Environment and Forests. However, the court added, that Alaknanda Hydro Power Co Ltd knew that the project is situated in geologically sensitive area of Himalayas, where cloudburst is not a rare phenomena. Though the environment clearance did not mandate a muck disposal plan, environment ministry issued directions on muck disposal in June 2011. The plea was filed by Srinagar Bandh Aapda Sangharsh Samiti and the convenor of Matu Jansangthan. The petitioners claimed that Alaknanda Hydro Power dumped muck from the construction project just after the gates of the dams, without taking precautions. 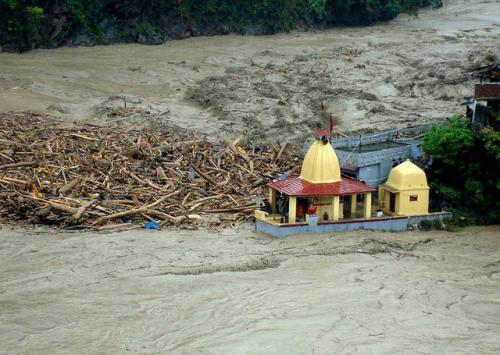 On June 16, 2013, extreme rains led to a disaster of unprecedented proportions in Uttarakhand, killing over 5,000 people.